In the early 1990’s, Price began experimenting with making her own fragrances and perfume sprays when she wasn’t busy working on the legendary sitcom The Cosby Show. She added oils to unscented lotions, and began learning the aromatherapeutic and healing properties of the oils. When the show finished its remarkable TV run in 1992, Price used the end of one chapter of her life to embark on another. With $100 in cash, her own kitchen, and the simple notion that people should follow their hearts, Lisa started building the collection that would become a beauty revolution. She began by selling her homespun beauty products at flea markets, but then had to set up shop in her living room as demand increased. Favorable word-of-mouth spread like wildfire as her customers enjoyed such unique products as Love Butter, Hair Milk, Black Vanilla Hair Smoothie and Lemon Mint Manicure. Her business continued to grow, aided by the encouragement and assistance of family members and friends. In August of 1994, Price officially established Carol’s Daughter (the company lovingly named after her mother). Initially starting out with a handful of steady customers, those numbers grew in leaps and bounds as women outside her neighborhood and circle of friends began to take notice. 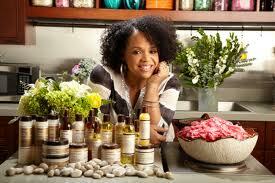 Almost overnight, celebrities like Jada Pinkett-Smith, Erykah Badu, Rosie Perez and Halle Berry became loyal customers. Price is the recipient of numerous awards, among them the National Black MBA Association’s Entrepreneur of the Year Award (2000), the Working Woman Magazine’s Entrepreneurial Excellence Award (2001), the National Book Club Conference Terrie Williams Inspiration Award (2004), the YWCA “W” Award (2010), the FFAWN I’m Power – I’m Beauty Award (2010) and a Cosmetic Executive Women Achiever Award (2010). She is also the author of Success Never Smelled So Sweet, a remarkable memoir that chronicles her transformation from a young Black woman deep in debt and burdened by low self-esteem to the president of a multi-million dollar business. Looking back on her years growing up in Brooklyn, Price vividly recalls her recurring connection with nature: a profound love and appreciation of the natural fragrances of the world. Price continues to encourage the entrepreneurial spirit of other women through her book, speaking engagements and business seminars. Price is an active philanthropist and currently sits on the board of the Foundation for the Advancement of Women Now (FFAWN), a charity that is dedicated to empowering women and instilling confidence so that they may achieve their dreams through education, empowerment and encouragement. The foundation was founded by Steve Stoute and Mary J. Blige. Today, Carol’s Daughter sells millions of dollars worth of products, employs more than 80 staff members and boasts nine stores across the country, with a flagship store in Harlem. Price hopes to continue expanding Carol’s Daughter to other cities. Price is dedicated to giving back to the community through both her business and her personal life. She has taken a hands-on approach to involvement in community fundraising walks and gala events for the Lupus Foundation of America. Additionally, Price generously and frequently offers product donations to community organizations both large and small in an effort to help Carol’s Daughter’s extended friends and family with their own outreach and fundraising efforts. Most recently, Price has been appointed as a member of the National Women’s Business Council, an independent source of advice and policy recommendations to the President, Congress, and the U.S. Small Business Administration on economic issues that face female business owners.